Cut a quantity of lemons in half lengthwise. Set several aside to dry slightly. Store the remaining in the refrigerator. Then gather: drying lemon halves, white construction paper, newspaper, and yellow paint. Pour the yellow paint into a pan, and have the child dip the lemon into it. Dab onto newspaper, and then have them make a print on the construction paper. After you finish the prints, make lemonade with the remaining lemons! Cut the strawberries in half and place one half in each clear plastic cup. Pour lemonade over the top and serve. Stir all the ingredients in a pitcher. Pour into tall glasses filled with ice cubes or crushed ice. For a sweeter pink lemonade, stir in maraschino cherry juice. For a sweeter pink lemonade, stir in maraschino cherry juice. This summer classic can also be frozen into ice pops or mixed with other fruit juices, such as orange, pineapple, and white grape. Makes about 3 cups. 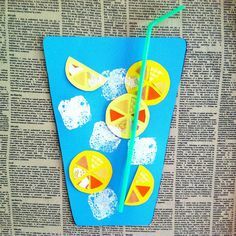 Let the children set up a Lemonade Stand on those hot summer days when people will be sure to be thirsty. Children will love feeling that they helped. As an extra bonus, this keeps them busy and out of the way. A small section of the yard, a sign, Lemonade, cups, ice and a small table and chair (for the jr. sales person). Let the children work this. They will get a great feeling of accomplishment at the end of the yard sale.